MilaX was a small-size live-CD distribution which runs completely off a CD or a USB storage device. It was based on OpenSolaris Nevada and includes its basic features. It originally started as an experiment to see how much OpenSolaris software could fit on a mini-CD, but it eventually became a full-fledged OpenSolaris distribution. It was also possible to use MilaX as a rescue CD. It can be installed on storage media with a small capacity, including bootable business cards, USB flash drives, memory cards, and Zip drives. MilaX was free to use, modify and distribute. Rate this project MX Linux, a desktop-oriented Linux distribution based on Debian's Stable branch, is a cooperative venture between the antiX and former MEPIS Linux communities. The project's latest update is MX Linux 18.2, which provides security updates, improvements to the installer, and an updated set of MX tools. "We are pleased to offer MX-18.2 official release ISO for your use. MX-18.2 is a refresh of our MX-18 release, consisting of bug fixes and application updates since our original release of MX-18. Note: existing users do not need to reinstall. All bug fixes and additions will come through the regular update channel. Updated packages: the latest updates from Debian 9.8 (Stretch), antiX and MX repos, including Firefox 66.0.2, VLC 3.0.6 and many more. New and updated mx-apps: mx-installer (based on gazelle-installer) now has configurable encryption cipher options as well as selectable ESP install location. Autoinstall also received fixes for partition alignment. mx-repo-manager now lists even more repository mirrors." Further details are available in the project's release announcement. Download: MX-18.2_x64.iso (1,382MB, SHA256, signature, torrent, pkglist). Also available from OSDisc. Dolphin Oracle has announced the release of MX Linux 18.1, an updated build of the project's desktop Linux distribution (with Xfce, based on Debian's "stable" branch) built as a cooperative venture between the antiX and former MEPIS Linux communities. This version is an "ISO refresh" release, featuring bug fixes and application updates: "We are pleased to offer MX Linux 18.1 official releases ISO image for your use. MX Linux 18.1 is a refresh of our MX Linux 18 release, consisting of bug fixes and application updates since our original release of MX Linux 18. Note: existing users do not need to reinstall, all bug fixes and additions will come through the regular update channel. Updated packages: the latest updates from Debian 9.7 'Stretch', antiX and MX repositories; Firefox 65.0; VLC 3.0.6. New and updated mx-apps: mx-installer (based on gazelle-installer) received fixes to address crashes during grub install; mx-repo-manager now lists many many more repository mirrors; miscellaneous bug fixes and improvements to MX-PackageInstaller and MX-Conky." Read the rest of the release announcement for more details. Download: MX-18.1_x64.iso (1,381MB, SHA256, signature, pkglist), MX-18.1_386.iso (1,396MB, SHA256, signature). The MX Linux team have announced the release of version 18 of their distribution. The new release is based on Debian 9.6 "Stretch" and features both core system updates and new versions of desktop applications. "We are pleased to offer MX-18 Continuum. MX-18 offers the following features: Updated packages - the latest updates from Debian 9.6 'Stretch', antiX and MX repositories: GIMP 2.10 (with plugins); MESA 18.2.6; updated firmware; 4.19.5 Linux kernel (with blk-mq file system corruption patch). The new kernels feature Meltdown and Spectre mitigation, even on the 32-bit kernel. The 32-bit ISO image has a PAE kernel for RAM usage above 4 GB. Easily change kernels, say to the latest 'liquorix' kernel or downgrade to Debian 'stable' kernel (4.9) with MX Package Installer. Firefox 64.0, VLC 3.0.3, Clementine 1.3.1, Thunderbird 52.9.1, LibreOffice 6.0.1, some Xfce components updated (Xfce Settings, Thunar). New and updated mx-apps: selectable themes for installed system GRUB boot menu and Plymouth boot-splash via mx-boot-options; system-keyboard and system-locale options allow easy access to configuration of system default keyboard and locales management...." Additional information can be found in the project's release announcement. Download: MX-18_x64.iso (1,375MB, SHA256, signature, torrent, pkglist), MX-18_386.iso (1,389MB, SHA256, signature, torrent). The first release candidate of the upcoming MX Linux 18 is now ready for testing. 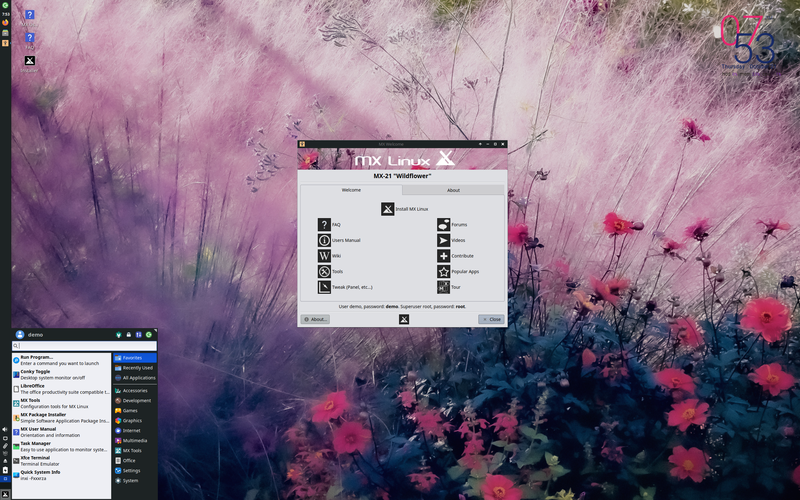 MX Linux is an increasingly popular Debian-based desktop Linux distribution (with Xfce) built in a cooperative venture between the antiX and former MEPIS Linux communities. This release fixes several bugs present in the beta, although it still retains a few known issues: "We are pleased to offer MX Linux 18 release candidate 1 for testing. The latest updates from Debian 9.6 'Stretch', antiX and MX repositories: GIMP 2.10 (with plugins), MESA 18.2.6, updated firmware, 4.19.5 Linux kernel (with blk-mq file system corruption patch), Firefox 64.0, VLC 3.0.3, Clementine 1.3.1, Thunderbird 52.9.1, LibreOffice 6.0.1, some updated Xfce components. New and updated MX applications: selectable themes for installed system GRUB boot menu and Plymouth bootsplash via 'mx-boot-options'; system keyboard and system locale options allow easy access to configuration of system default keyboard and locales management; updates to MX package installer, including faster performance...." Read the rest of the release announcement for further information. Download: MX-18RC1_x64.iso (1,369MB, SHA256, signature, pkglist), MX-18RC1_386.iso (1,382MB, SHA256, signature). MX Linux is a desktop-oriented Linux distribution based on Debian's Stable branch and is a cooperative venture between the antiX and former MEPIS Linux communities. The project has released a new development snapshot, MX Linux 18 beta 1. "We are pleased to offer MX Linux 18 beta 1 for testing. The latest updates from Debian 9.6, antiX and MX repositories: GIMP 2.10, MESA 18.2.6, updated firmware, 4.19.5 Linux kernel, Firefox 63.0.3, VLC 3.0.3, Clementine 1.3.1, Thunderbird 52.9.1, LibreOffice 6.0.1. New and updated mx-apps: system-keyboard and system-locale options allow easy access to configuration of system default keyboard and locales management; updates to MX package Installer, including faster performance, Flatpaks, and popular application entries. ; mx-installer (based on gazelle-installer) now includes LUKS encrypted root, home and swap partition options; mx-codecs updated to install updated S3 texture packs (important for Valve/Steam games in particular); improved localization: almost all mx-apps received translation updates; new Conky configurations; the login screen has locale selection options now; Thunar custom actions updates...." The release announcement has further details and a list of known issues. Download: MX-18b1_x64.iso (1,303MB, SHA256, signature, pkglist). The MX Linux project has announced the release of MX Linux 17.1, a desktop distribution based on Debian and featuring the Xfce desktop environment. This version delivers a recent Linux kernel, new and improved "MX apps" and updated applications, including Firefox 58 and LibreOffice 6: "MX LInux 17.1 released. This release is a roll-up of all updates since the initial release and features the following highlights: 4.15 kernels for both 32-bit and 64-bit ISO images (the 64-bit ones are patched for the Meltdown/Spectre issues)l the 32-bit ISO image has a PAE kernel for RAM usage above 4 GBl easily change kernels, e.g to the latest Liquorix kernel or downgrade to Debian Stable kernel (4.9) via the MX package installer; the latest updates from Debian, antiX and MX repositories; updated packages - Firefox 58.0.2 (59 hitting repository soon), VLC 2.2.8 (3.0 in test repository), Clementine 1.3.1; Thunderbird 52.6.0, LibreOffice 6.0.1, LuckyBackup 0.4.9, Passwords and Keys 3.20.0, Xfce Terminal 0.8.3; MX-Updater now has an 'auto-update' option in preferences that enables unattended upgrades...." Read the rest of the release announcement for further information. Download (MD5): MX-17.1_x64.iso (1,262MB, pkglist), MX-17.1_386.iso (1,279MB). MX Linux is a medium-weight Linux distribution based on antiX and Debian's Stable branch which features the Xfce desktop environment. The MX developers have published a release candidate for the upcoming launch of MX Linux 17.1. The release candidate features updated kernels, Firefox 58 and the option to automatically install software updates. "MX-Updater now has an 'Auto-update' option in preferences that enables unattended upgrades. MX-Live-USB-Maker is a new, more functional frontend to the antiX live-usb-maker CLI utility. It also offers a 'copy image to USB (dd)' mode for non-antiX/MX family ISOs. MX-Tweak adds a "Config Options" tab for resetting LightDM and Thunar custom actions to the distro defaults. Almost all MX-apps received translation updates (we love translators). Updates to MX Package Installer, including faster performance. Improved localization: localization of the Thunar custom actions menu. Additional translations of our MX-manual (including German, French, Russian, Italian and now Spanish!)" Additional details can be found in the distribution's release announcement. Download (MD5): MX-17.1-RC1_x64.iso (1,261MB, signature, pkglist). The MX team has announced the release of MX Linux 17, a lightweight distribution based on Debian and featuring the Xfce desktop environment. The new release is based on Debian 9.3 and ships with Xfce 4.12. "MX Linux 17 final images are now available for download. This release features the following: 4.13 kernels for both 32-bit and 64-bit ISO images (yes, we still have 32-bit); the 32-bit ISO image has a PAE kernel for RAM usage above 4 GB; easily change kernels, say to the latest Liquorix kernel or downgrade to Debian Stable kernel (4.9) with MX Package Installer; the latest updates from Debian 9.3.0 and Xfce 4.12.3; all the antiX live features, including persistence (up to 20 GB) and remaster tools; automatic selection of appropriate drivers for most Broadcom chipsets (in most cases, no user intervention required); updated packages - Firefox 57.0.2, VLC 2.7, Clementine 1.3.1, Thunderbird 52.5, LibreOffice 5.4.1, LuckyBackup 0.4.9, Passwords and Keys 3.20.0, Xfce4 Terminal 0.8.3...." Further details, an overview of the custom MX tools and key package versions can be found in the distribution's release announcement. Download (MD5): MX-17_x64.iso (1,214MB, torrent, pkglist), MX-17_386.iso (1,239MB, torrent). 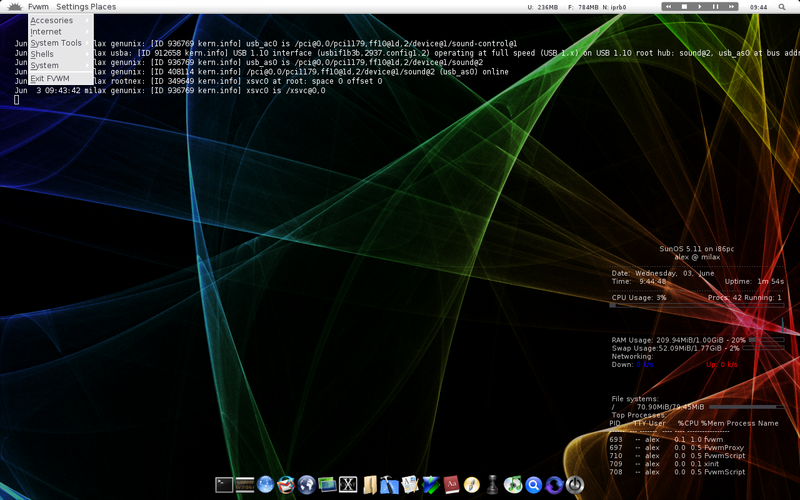 MX Linux is a desktop distribution based on Debian's Stable branch. The distribution ships with the Xfce desktop environment and swaps out the systemd init software provided by Debian for the SysV init implementation. The project has released a new development snapshot, MX Linux 17 Beta 1. "MX-17 Beta 1 images are now available for download and testing. The Beta 1 features the following: latest live system changes and fixes from the antiX project; the latest updates from Debian (Stretch); 4.9 Linux kernel; the 32-bit ISO image has a PAE kernel and the non-PAE has been removed; updated packages, including LibreOffice 5.4.1 new and updated mx-apps; mx-tweak replaces mx-defaultlook and provides one-stop spot for simple compositor (Xfce or Compton), panel, and other 'tweak' type changes; mx-conky provides a method for doing simple edits to Conky files (color changes, etc. ); mx-network-assistant replaces mx-broadcom-manager as a general purpose network troubleshooting tool; mx-tools now has a larger interface; changes to the update manager (apt-notifier), including new themes available in preferences; misc changes to most of the other mx-apps." Further details can be found in the project's release announcement. Download: MX-17.b1_x64.iso (1,170MB, MD5, signature, pkglist).